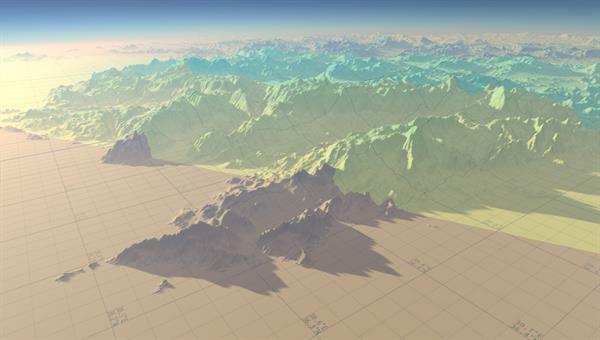 Four cascades are used to simulate shadows on SRTM30 elevation data of Earth. In DLR’s department for Simulation and Software Technology, a virtual-reality simulation of our solar system is being developed. With sophisticated level-of-detail-algorithms, high resolution digital elevation models and satellite imagery, entire planets and space missions can be explored in real-time. Light and shadow play an important role in realistic space simulations. However, there are a lot of parameters which can be used to tweak the quality and efficiency of the shadow calculation. In the scope of this thesis, a system shall be developed which takes several factors (such as user’s view direction, distance to the planet’s surface or the distance to the horizon) into account in order to automatically create an optimal parametrization of the algorithm. The impact of each parameter on the shadow quality and algorithm performance shall be discussed. Finally, tests and benchmarks shall prove the efficiency of the implementation.